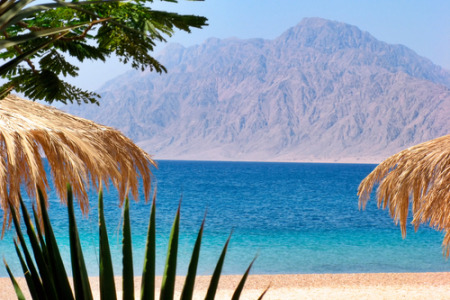 Nuweiba holidays take you to Egypt's Gulf of Aqaba in the Sinai Peninsula. It is a popular resort, surrounded by desert and mountains, with a stunning coastline of soft sand and clear waters. Holidays to Nuweiba can be enjoyed at any time of year as the summers are long and hot and the winters mild. Indeed, November to April are the most popular months as the temperature lies pleasantly in the twenties. At the height of the summer they can reach the high thirties. Holidays in Nuweiba have wide appeal with families and couples of all ages flocking to its shores. With rather low-key evenings and limited licensed premises, the resort is not popular with young singles. Our low cost Nuweiba holidays can be as relaxing or as active as you wish as there is plenty to see and do. The wide range of water sports include diving and snorkelling in the reef which teems with marine life. There are many sightseeing opportunities with desert safaris and boat excursions. If you are seeking a guarantee of sunshine in a resort with great natural beauty, you may be tempted by our cheap Nuweiba holidays. With excellent accommodation and amenities, they offer great value. Since our bargain Nuweiba holidays fly from the shelves, it is best to book early in order to avoid disappointment. For further information and to discover our best Nuweiba holiday deals, please use the search facility.